How am I going to have time for one more relationship? Let alone eight new relationships with my neighboring houses? 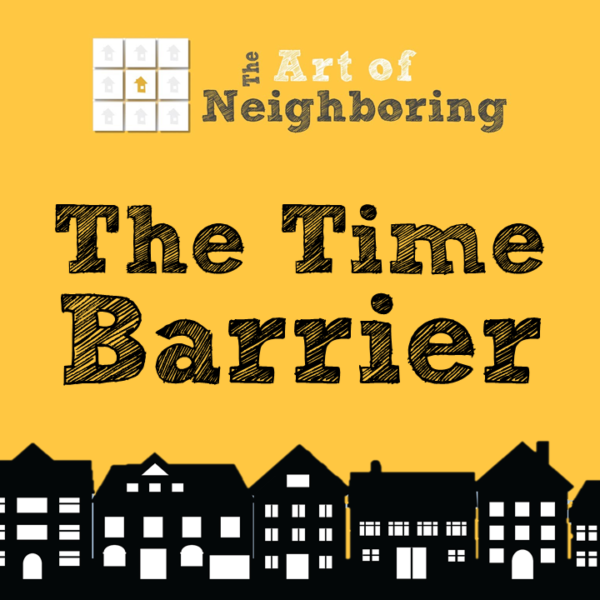 Time is the biggest obstacle we need to overcome to be effective and loving neighbors. Big Question: Are we living at a pace that allows us to be available to those around us? You don’t need to stop everything you’re doing right now to make this happen, but can you take a look at your commitments and are you willing to re-prioritize them so that you can be more present with your close family and friends? 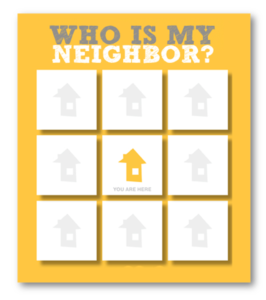 Can you make room in your life for the people living around you – your neighbors? How many names can you fill in for the eight closest homes to yours? Step Two is to look for ways to create margin in your life and in the schedule of your family so that you have time to actually be with them and you are available to build relationships with your neighbors. This may mean eliminating something else for the sake of loving your neighbors and obeying Jesus Christ.